Feeling sad is one thing, but a persistent feeling of sadness can overtake your life, and is anything but unhealthy. Depression is not something to be ashamed of. It is a common condition, that can be treated if identified early. Treatment of depression usually involves a combination of medication and psychotherapy. The effects of depression vary from person to person, but some symptoms are commonly experienced in all cases. These symptoms can be categorised as physical changes, behavioural changes, cognitive changes and emotional changes. Physical symptoms of depression: Feeling tired all the time is one of the most common symptoms of depression. The person may also have persistent headaches and sporadic muscle pains. Insomnia or sleep troubles are often associated with depression. This can further lead to significant fatigue, and a vicious cycle ensues. Sleep troubles can also lead to the formation of dark circles under the eyes, and make the patient’s skin look dull. Patients suffering from depression often find themselves losing weight due to a significant loss of appetite, or find themselves snacking excessively, and hence, putting on weight. Behavioural symptoms of depression: Depression can make a person withdraw from his or her friends and family and become a recluse. A loss of interest in activities that would usually excite the person is another characteristic symptom of depression. This condition can make a person unable to concentrate or focus on work and other activities, and hence, may affect productivity in school or the workplace. Depression can also make a person rely heavily on alcohol, sedatives etc. Cognitive symptoms of depression: Depression can make a person feel worthless, and leave them with a bleak outlook on life. A depressed person will often find himself or herself criticising themselves harshly for things that may or may not be their fault. This can make them increasingly more agitated or irritable. 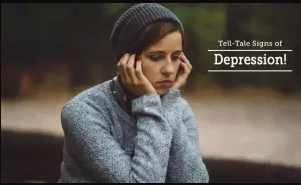 Depressed people may also turn to violence and trigger reckless behaviour such as gambling, substance abuse, reckless driving or taking up a rash sport. Emotional symptoms of depression: Feeling sad for no reason characterises depression. This sadness can overwhelm a person and make them feel guilty about indulging in anything that could make them happier. It can also make the person lose confidence in himself/herself, thus making him/her indecisive about simple decisions. Other emotions that are commonly experienced by depressed people include irritability, frustration, guilt, and disappointment. A frequent but ignored symptom is thoughts of self-harm or suicide, leading to deliberate self-harm/suicide attempts. If you or someone you know suffers from any of the above symptoms, you may need help! Visit your Psychiatrist at the earliest to have yourself evaluated, and started on an appropriate course of management.